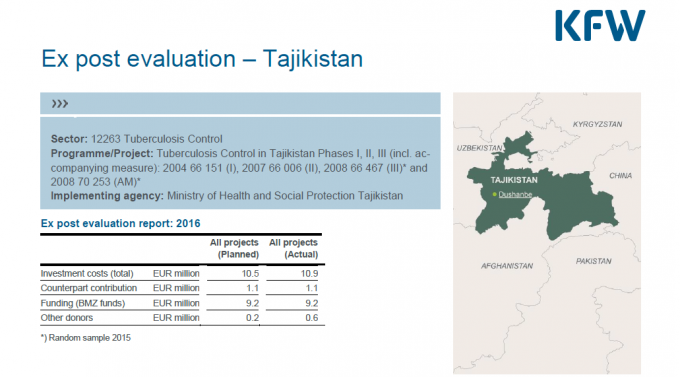 KfW-funded Tuberculosis (TB) Control Projects, which EPOS provided technical assistance to the Ministry of Health and Social Protection in Tajikistan for implementation, have received the highest ranking of success in a recent post-project evaluation. Taking into account the ‘relevance, effectiveness, efficiency and overarching developmental impact’ of project measures, the evaluation highlighted the positive impact projects have had on ‘rationalizing and boosting the efficiency of TB treatment’ in Tajikistan. The overall aim of the projects was to improve the diagnosis and treatment of different forms of TB. Project measures spanned several years, focusing on strengthening the diagnostic and therapeutic capacities for treating TB by developing and expanding related infrastructure and equipment through several phases. Project measures evaluated in the recent assessment encompassed ‘the rehabilitation of the national TB hospital "Macheton", including the construction of a new department for patients with multidrug-resistant TB according to the latest epidemiological hygiene standards (TB I and TB II) and the provision of diagnostic and surgical equipment (partly TB III). One floor of Macheton Hospital was equipped as a biosafety level 3 laboratory (TB II and TB III) and functions as the National Reference Laboratory (NRL). Furthermore, the projects comprised a twinning arrangement between the NRL and the supranational reference laboratory Gauting for the quality assurance of the NRL. The accompanying measures comprised training to maintain and improve quality and management’. This successful post-project evaluation attests to the experienced, professional and dedicated team members that worked in partnership with local and international organisations to implement successive phases of the TB program. EPOS is delighted to have had a part in establishing sustainable support for the efficiency of TB treatment in Tajikistan.